I got this for my husband. He likes it. We used it for a month and is still functioning fine. - It is easy to install. It has helpful tips to provide guidance. - easy to navigate and has multi-functions. - the touch sreen is very sensitive. - The playback as very clear. You could clearly see the front car's licensee plate from the playback. The rear camera was quite big. We needed to ask a tech to install for us. I am returning this front and rear dash camera. Why is it that I am unable to adjust the new larger mirror from the day/ night mode which my "old" mirror did? This is an important safety feature for those of us who are sensitive to the headlights of the cars in back of us when driving at night. It has been missed in the design, unless I am missing something? New driver in the family so I bought this just for peace of mind. Wow, great device! Simultaneous front and rear recording. We already had a backup camera so we just mounted the rear camera in the rear window - all good. I suppose you could use rear camera to monitor car interior if you wanted and already had backup camera. - Camera easily adjustable on the fly. - Display stays active on mirror a little too long on after startup (minimum setting is 3 minutes). I realize you can manually turn the display off using the power button, but it would be nice if the display went into sleep mode quicker - especially when driving at night. - Would be nice if there was an easier way to view the videos remotely (perhaps not realistic at this price-point). I’m actually quite impressed with this! I hope it can withstand the cold Alberta winter weather tho. So let’s see. But so far so good. I was a bit concerned with putting it over top of my existing rear view mirror, because I need a good mirror to drive.... but it’s actually really good! You can see everything still, but it’s a much wider range. The wire to go into the lighter was much longer than the other dash cam I bought so I can easily hide and run the wire along the passenger side. Just need to install the backup camera. Decent quality for what I paid! Would recommend! I ordered this dash cam a few days ago. To my surprise, in the midst of Canada Post rotating strike, the package arrived in 3 days. When I opened the box, I found a few items that are not mentioned in the product description: a little plastic tool and a few self-sticking small plastic clips. I soon found out they are actually essential to the installation of the camera. The little plastic tool can be used to pry open the trim where you want to hide the camera wiring. The little clips can be use to hold the writing where you cannot tuck the wiring inside anything. I used 2 of these clips in around the glove compartment area. Mounting the camera onto the rear view mirror is not an easy task for me. This is because my car’s rear view mirror is designed with the reading lights and GM OnStar gadget in it; so it is very bulky. The straps come with the dash cam are not long enough to wrap around my rear view mirror. I have to use a few rubber bands looped to the end of the strap to remediate the problem. The front camera give a good quality picture/video, the rear camera picture quality is acceptable. I found out that not all Class 10 micro SD cards are created equal. The first card, which works fine on my phone and computer, that I put in the camera seems to record everything, but some of the recorded files cannot be play back on my computer. Then I put a class 10 with write speed up to 20 MB/s card onto the camera, now I can play all the files. The files are recorded in 2 directories; one for the front camera and one for the rear camera. I am very happy about this purchase. It is a good buy for the money. Very good driving recorder. Good options package on the controls for this dash-cam. Buttons on the bottom are easy to access and useful in navigating the on screen menu. Touch screen is also handy for quickly selecting items. 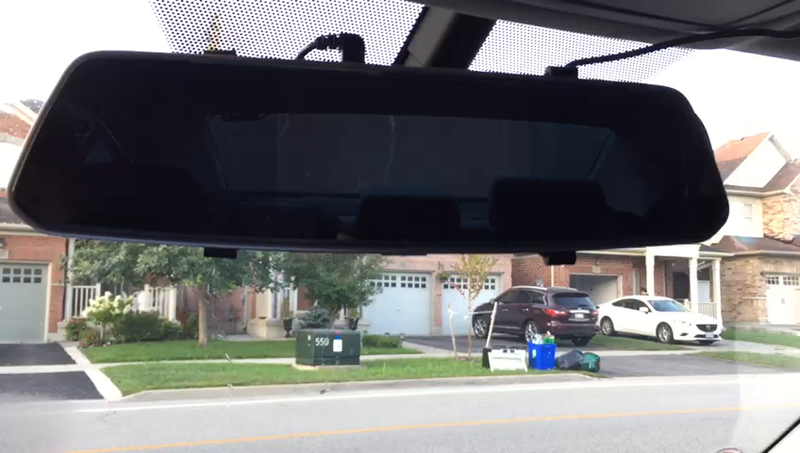 This dash-cam offers a lot more functionality than some of the other dashcams I own, including the ability to scroll through and view previous videos. Camera is very clear and the HUD is again very clean, not cluttered. Night vision mode also works very well. All in all, this product is really good value in exchange of the price it offers. 5.0 out of 5 starsJust an Excellent Camera Recording System for your vehicle. I picked this system up and was immediately impressed with the quality. So impressed I will be picking 2 more up for my kids vehicles. Pros: Well made, company will gift a micro SD card if you write a review, records forward and rear simultaneously (or you could hook up the back up camera), very easy install, light enough in weight not to stress your mirror hinge, more assessors than you could use, very easy to review footage, Company is excellent. Hhighly recommended. I expected the rear camera to be 170degree and did notice that it is 140degree as per Q&A on the product. The mirror is dual color so when display is off you will see light blue screen around the center display rectangle. I indicated both matters to the CHORTAU customer service and they were very kind and prompt in their response and supportive for their product. The wiring for the rear view camera is easy and straight forward. The camera installation is also simple. Based on my discussion with Customer Service and the ease of working with product, I was convinced and satisfied with what I received. Quality matches with product value. Would buy same product again if I need another rear/front view camera system. Easy to operate , a little difficult to install. You have to go out and purchase a high speed micro sd card. This should be clearly communicated before you purchase the product . Don't understand why you would sell the unit without all the parts that you need in order for it to be fully functional ?